Striker Chris Long is eager to get among the action for the Clarets this term having pushed his way in to the 18-man matchday squad. 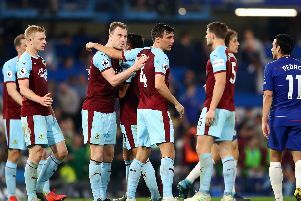 Burnley boss Sean Dyche had hinted at a potential loan move for the 20-year-old following his switch from Everton in July, but the departures of Jelle Vossen and Marvin Sordell, and injury to Lukas Jutkiewicz, has seen his circumstances change. Long, who has represented England from Under 16 to Under 20 level, featured from the bench in recent wins over Sheffield Wednesday and MK Dons at Turf Moor, and got 35 minutes as a second half substitute in Saturday’s 2-1 defeat at home to Reading. And Long is happy to be contributing. “It’s all for the team,” he said. “As long as we get the result then I don’t care to be honest. “There’s good competition, especially with Andre (Gray) who I played with last year. He’s a good friend. “There’s (Sam) Vokesy and Rouwen (Hennings) too but unfortunately Juke did his cruciate. “They’re all good lads and it’s a good strike force. “It’s been good and I’m learning a lot, especially with all the hard work. “I’m learning a lot from the manager. When I first came in I hadn’t had a pre-season but I’m back fully fit now. “I’m feeling sharper and fitter now which came from getting involved with the first team. “I hadn’t had a pre-season, I’d missed quite a few weeks, but I’m back at it now. Long netted four goals in just two starts for Brentford in the Championship last term, and he’s eager to show his goalscoring capabilities at his new club. “I’m confident. I can score goals - that’s what I do,” he said. “I proved it last year. “Hopefully I’ll be given my chance so I can provide and show that I can do it. “Hopefully I’ll get my chance and take it. “If I get myself in there I want to start scoring goals and stay in there. “I want to work hard for the team, score the goals and contribute to the results. “Andre’s back fit now I think but hopefully I can start. I’ll do everything for the team, work hard and hopefully get the result at Rotherham.